Coarsely grind coconut, turmeric powder, cumin seeds and curry leaves. 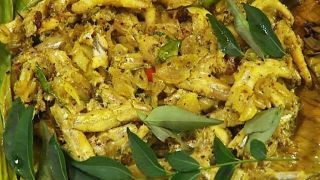 Mix anchovy, kanthari mulaku, shallots, ginger, garlic, curry leaves, salt and kudampuli. To this add 2-3 tsp of oil, crushed pepper, a pinch of fenugreek and again mix well. Place it on a plantain leaf. Pack it in the plantain leaf and place it in a pan or a clay pot and keep it on a flame. Pour oil above it and close the lid. Cook on low flame. When one side gets cooked, turn to the other side and cook the same way. Fish gets the smell of plantain leaf.